I was so thrilled to be accepted onto the Design Team for My Time To Craft. I have followed and entered many of the challenges since I first joined in blogland, it has always been one of my most favourite challenge blogs, and now I am part of the team. Woweeeeeeee! thanks to Shell and the remainder of the team. For my first week there is a sketch to follow. I do like sketches for they make me look at designing in more ways than I would normally, taking me out of my comfort zone, therefore learning new ways and techniques. Which after all is what challenges are all about, isn't it. I literally flipped the sketch and used papers from fizzy Moon and LOTV. the stamp is an old favourite of mine - Santa from Inkadinkado. I look forward to visiting you guys over the next week. Have fun. 'Hip to be Square' our entries MUST be SQUARE. 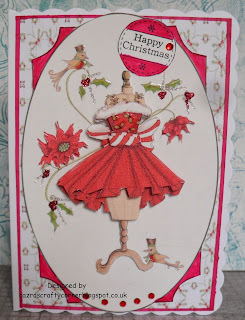 This week at CD Sunday Challenges it was my turn to choose the topic, so I chose F is for......... and in my case F is for Fabulous Festive Fashion a CD from Katy Sue. Following on from the highly popular CD Fabulous Fashion came the one with Christmas fashion. This is my card. Both the background paper and the main image are from the CD. There are some many variants but I have used a decoupaged version of the dress. I added silver, red and green glitter to the image. I also used Glossy Accents to add an extra shine. The Design Team have shown how differently we can interpret the challenge, I am so looking forward to what you produce for F is For.......... Above all please have Fun. At Alphabet Challenges we seem to be going through it very quickly this year, which must mean the year has just flown by for me, do you feel the same way too? Here we are already at the letter U for which Jan has chosen the word Umbrella. A good choice for it always seems to be dark, cold and rainy days in November, certainly here in the North East of England. 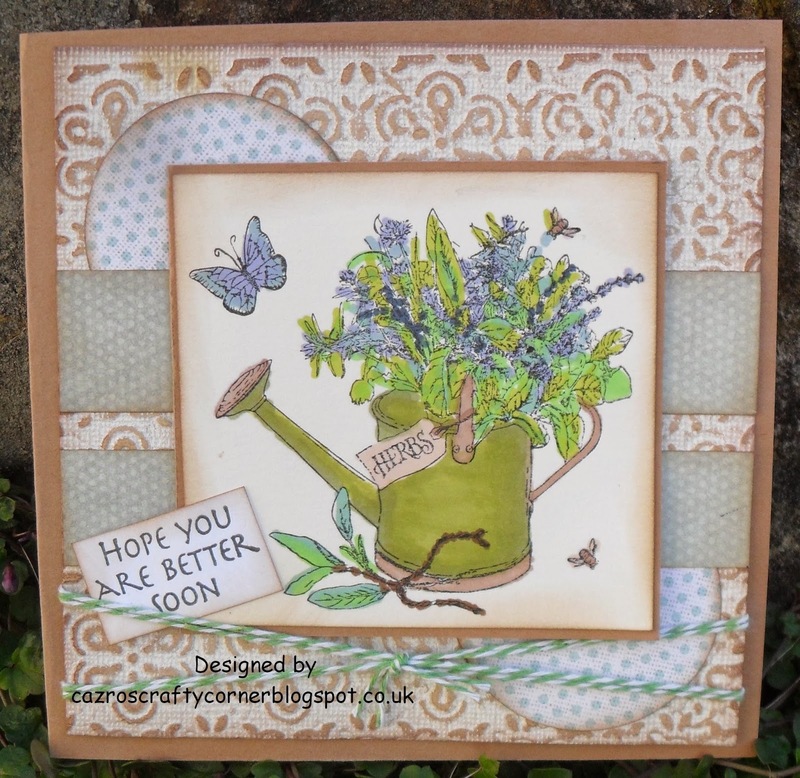 My card is quite different for me this fortnight for it is a C6 card, these days I nearly always make a square or unusual shaped card, but C6 is where I started so back to basics. The background paper is from my stash. The image is from a Crafter's Companion's Frou Frou CD. This card is one of three I made from one printed sheet. The greeting Dreaming of Summer Days is from LOTV. I am sure you will have fun, I look forward to once again visiting you during the challenge. My Time to Craft are this week challenging us with Baubles. 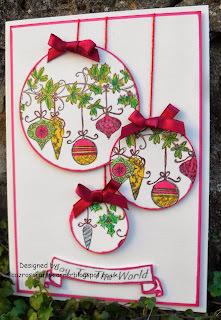 I needed to make a few cards and the Design Team inspired me to make some Bauble cards. This is one of them. I started with a 5 x 7 inch card, these are familiar in the UK not so sure about the US. I then cut a piece of white card and marked the edges with a red Promarker to give it an edge, this was later added with 3D foam pads for dimension. Using a LOTV bauble garland stamp, I stamped it out twice. I then punched out from the two stamped images different parts with 3 different sized punches. I coloured each design with Promarkers and edged the circles as I had previously. I added some red thread, adhered the baubles with 3D foam, then added the red bows. The greeting Joy to the World is from a Katy Sue stamp set. 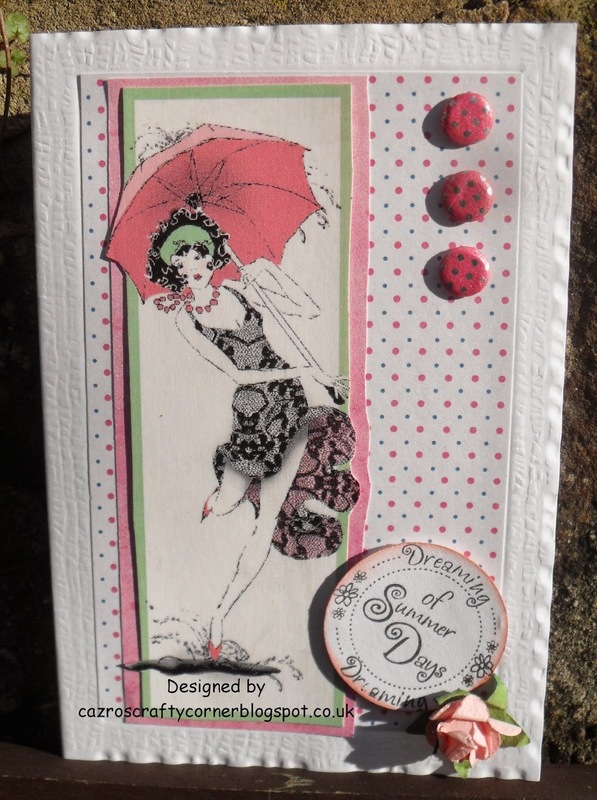 Thanks for the challenge ladies, I so enjoyed making this card. This week at Fan-Tastic Tuesday, where it is Hip to be Square, our challenge is to Make It Fancy. Your choice on how this is achieved, let your imagination guide you. I have recently acquired the wonderful CD of Fabulous Festive Fashion - Katy Sue, the backing paper and main image are from this CD. I added a Frosty Border die from Memory Box. Hopefully in the enlarged photo you will see the silver, green and red glitter on the boot. 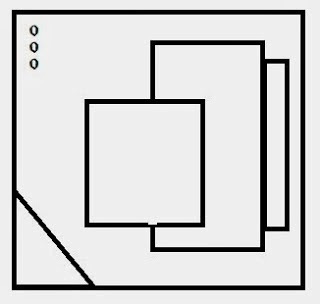 I look forward to visiting you, remember your project must fit in the theme AND be a square project. Have fun. 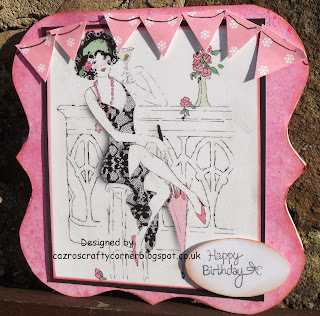 At CD Sunday Challenge for this week Jenny has chosen for us Simply Square. I'll be honest I would say 75-80% of my cards are square, various sizes but square. I always think they look elegant. 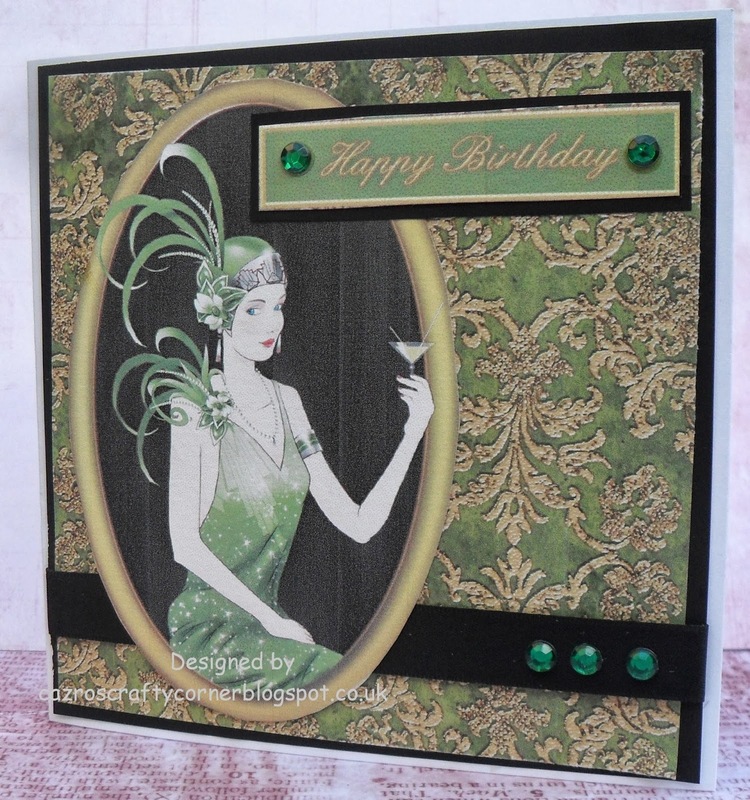 For my choice I went to Debbie Moore Art Deco Glamour, the background paper and image are from the CD. 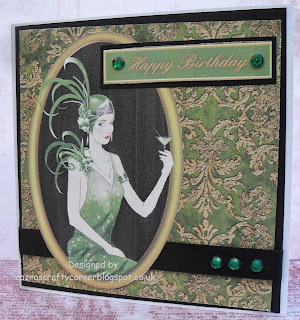 I added a piece of black ribbon, green gems, black card for matting. Yes, I could have added glitter, but to save you looking I didn't this time. 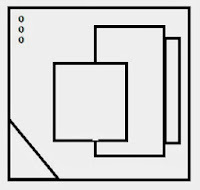 So this week you have a very wide choice for your card, nothing difficult at all, just keep it Simply Square and please have fun. 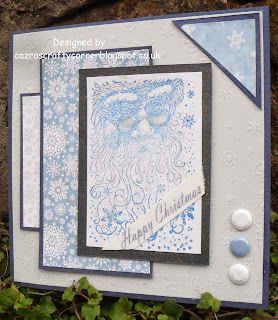 This week at Creative Corner the theme for the challenge is 'Let It Snow'. It always looks so picturesque, when it first falls, kids can have so much fun playing in it. Living in the North of England, over the years I have seen more of my fair share of the white stuff, I have struggled walking miles in it to get to work, when neither cars or public transport can beat it, but I still fall for the romantic sound of it all, Let it Snow (not please here at home until the earliest Christmas Eve - thank you). Here is my card, I used a DI Iced Spruce over a Stamps Away snowflake mask, added some punched out snowflakes to add a little sparkle. 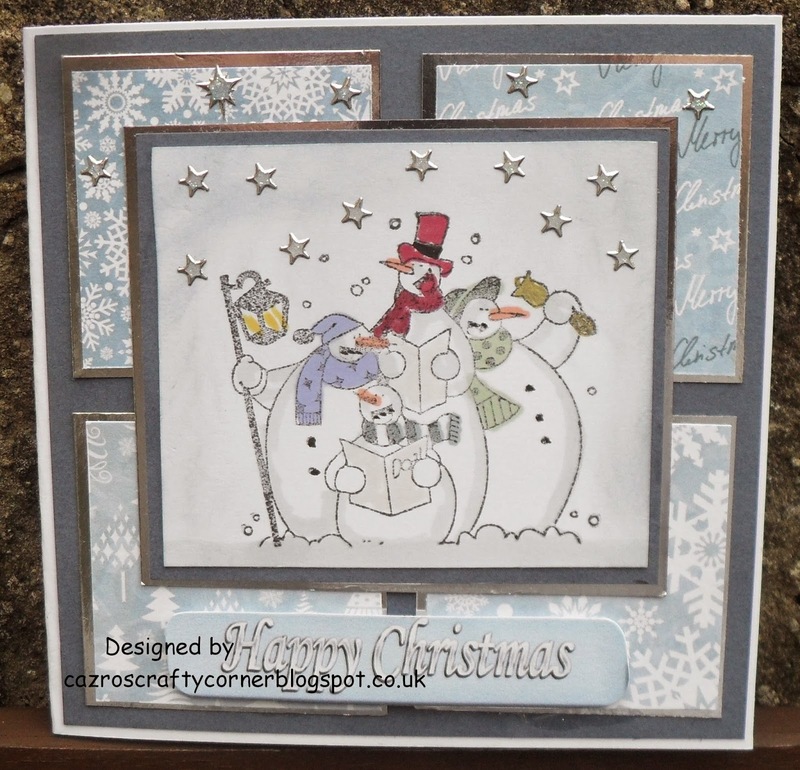 Using Versamark I stamped an Inkadinkadoo snowman, I've had him for maybe 8 years or more, added fine detailed white embossing powder, then heat embossed. The greeting is from a Chloe Stamps. Here we are again on the 15th of the month back to Sparkle Monthly, this month we are asking you to use an ANIMAL on your project. It being so close to Christmas, not surprisingly, some of the DT, (maybe all), have chosen to use a Christmas related animal. 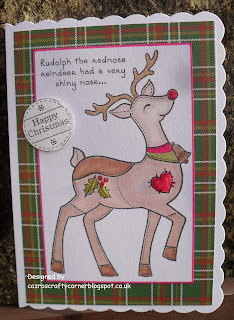 Who can resist this wonderful new stamp from Woodware of Rudolph, isn't he just magnificent? I coloured him with Promarkers, I used LOTV Classic Christmas design paper for the background. The sentiment is from Dreamees. 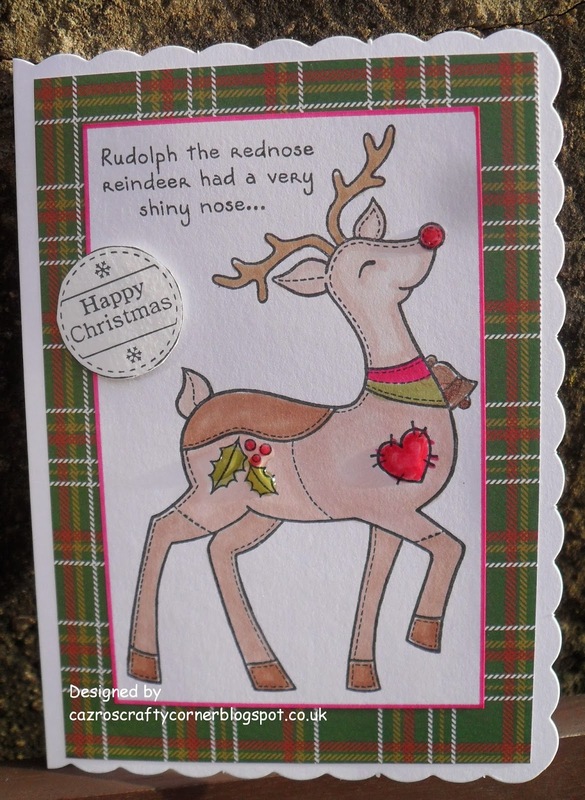 I have used Glossy Accents on his nose, heart and holly leaves, which I am hoping you can see when the picture is enlarged. I look forward to visiting you all, we have a system of commenting on a certain number of entries over the month, but I can assure you, I do enjoy visiting every one of you. Have fun and hopefully be well. Please check out all of the details at Sparkle Monthly. My second grandson celebrated his eighteenth birthday on Monday this week. Over the weekend I had made this card for him. 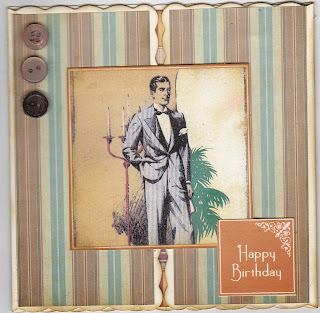 He is a very snapper dresser, he loves vintage clothes, so I thought this card would be well received which I am delighted to say it was. 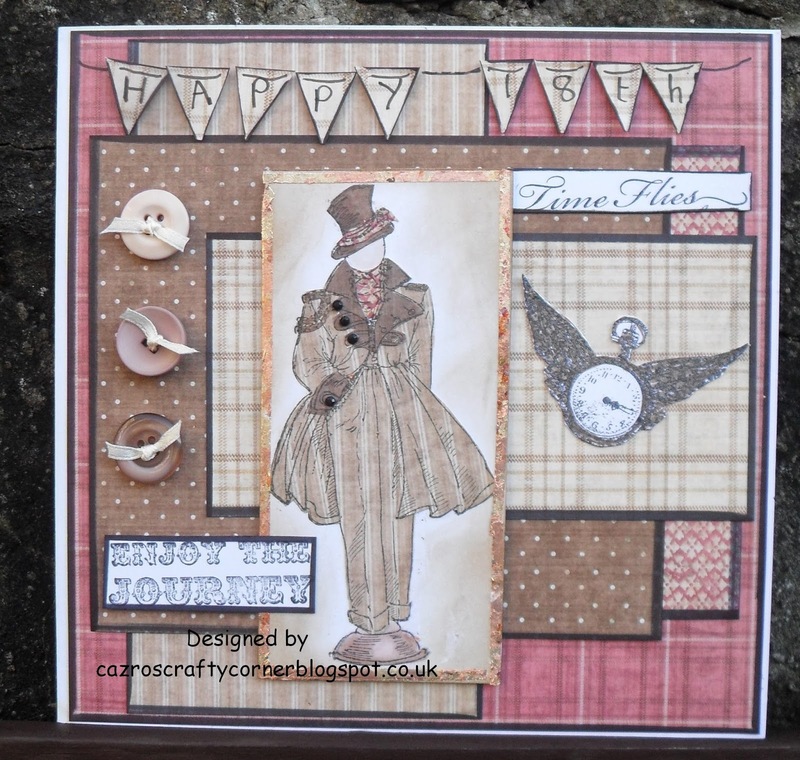 Over at Crafty Cardmaker their theme this week is Paper Piecing which is the technique I used to dress this Kanban gentleman to give it a more fashionable appearance. I used the same papers as were used for the background. They are from a Country Gent by LOTV. I made the bunting, added threaded buttons. 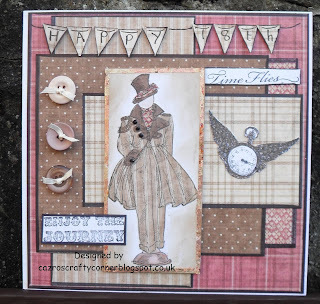 The Time Flies and clock with wings are one stamp from Stampendous. 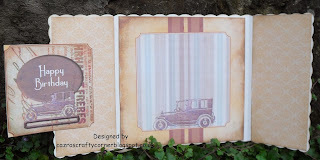 Enjoy the Journey is from a Creative Expressions stamp set of Vintage Transport. 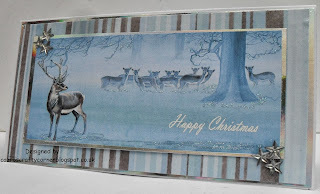 Hello, another week nearer to Christmas, I'm sure I have enough cards for my own use now, so anything else is either to be sold or off to the Salvation Army Charity Shop. For my DT card this week the theme is - It has be to be square, any project you wish, it can be Anything Goes but you MUST ADD STARS. 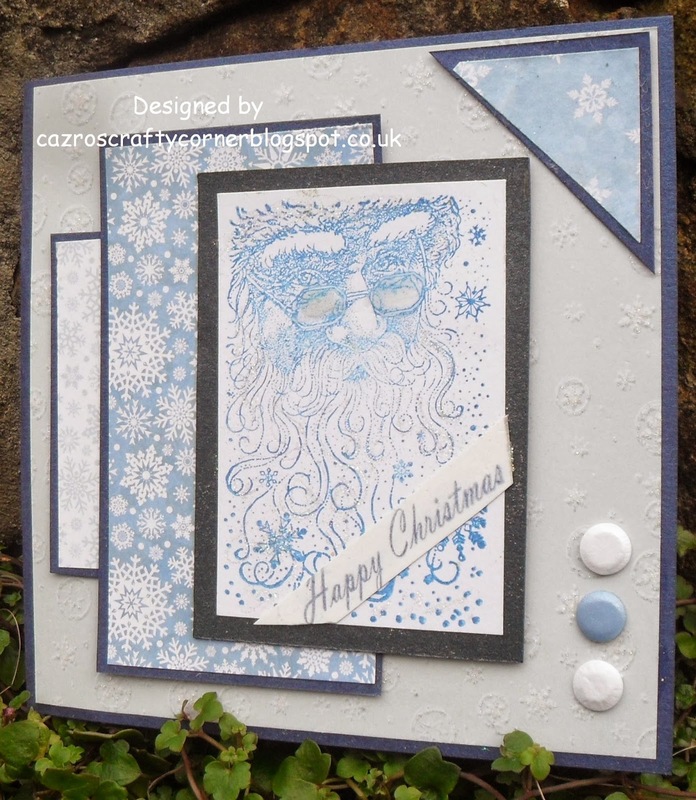 I have used for the background papers the Blue Christmas from LOTV, matted onto navy card sock. 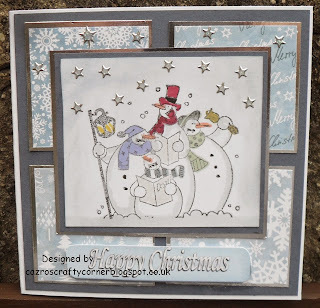 The main image I have had from my early days of stamping, could be an Inkadinkado but being honest I'm not sure. I do know I love it and have used it almost every one of the ten years I have had it. I coloured it with Promarkers and the stars are well, shh!! don't tell the stamping purists but they are peel off stars. I'm looking forward to visiting your blogs to see your stars. Have a nice week and a fun time creating. For this week Sue B at CD Sunday Challenges has chosen for our theme Pennant Parade. 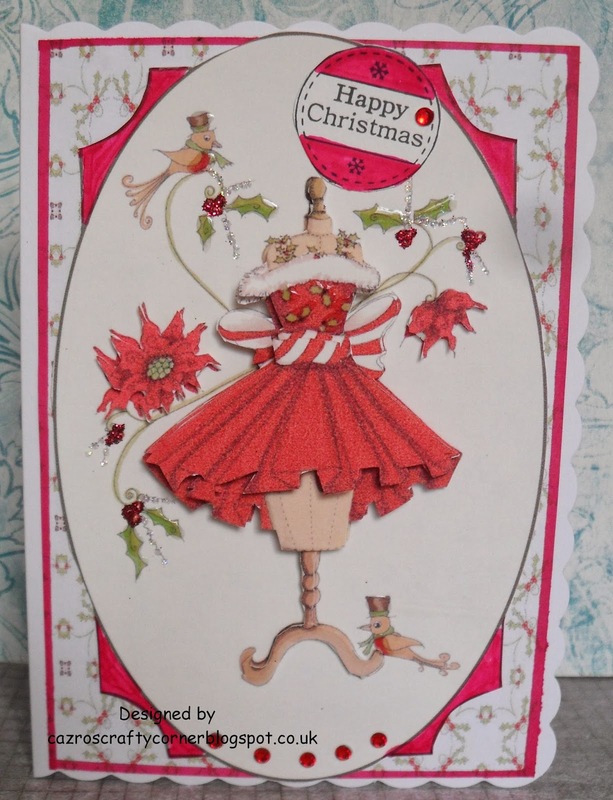 I used the Crafty Companion's CD Frou Frou to make this card. The pennants are from a Dreamees CD. It always amazes me how many cards you can get from one printed sheet, I managed three from this one. Have fun everyone, I am sure with this theme we will get a wide variety of projects/cards. At Alphabet Challenges for the next two weeks Marie chose for the letter T - Twine, a good choice, especially if your like me and have a few rolls in your stash. It's so nice to have a little piece of normality after Halloween and before the next Christmas rush of cards. 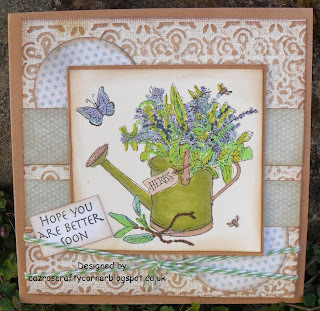 I decided to make a card ready for if and when a friend is feeling poorly. A good card to have ready on hand. I started with plain Kraft card. 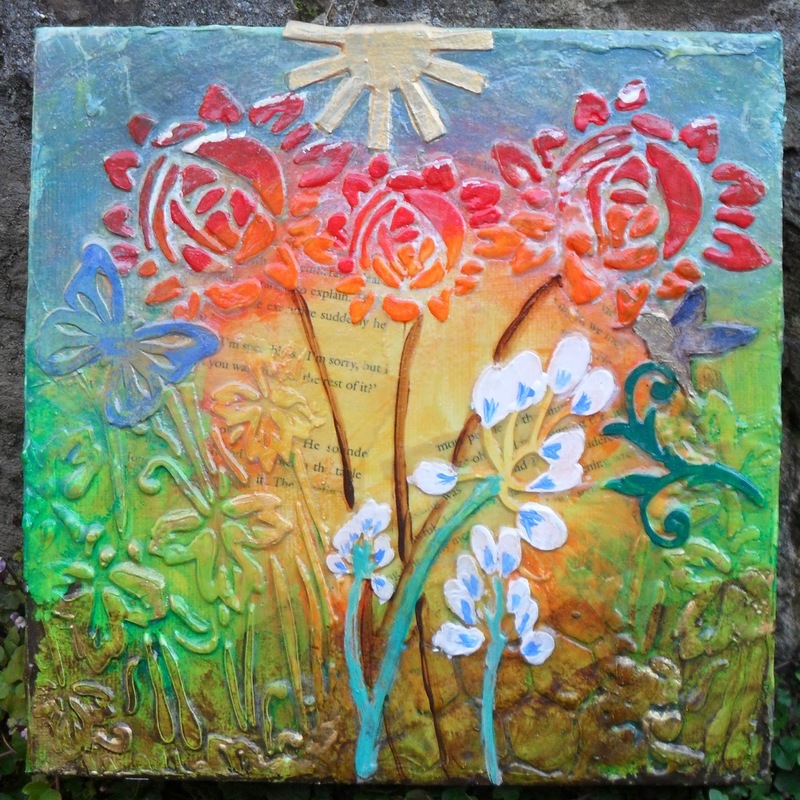 I embossed a piece of white with Kraft Core-dinations, embossed it then rubbed it down. After exposing the inner part, I then edged and swept over it with DI Vintage Photo. Added a few pieces of green patterned paper for contrast in layers. The main image is a stamp from Joanna Sheene. I coloured it with Promarkers. Added the twine and a small greeting which I think reads better than the order to Get Well Soon. Greeting stamp from Hobby Art. I look forward to visiting you over the next few weeks. Last Saturday, I had the greatest pleasure in attending a full day workshop with Sarah Hallum (Peerless Designs CDs and Masks) at Frankie's Craftytouch Clark shop in Darlington. 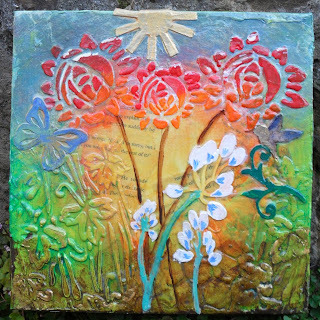 It was a wonderful day, of learning new techniques, in mixed media with a super group of women and of course the very talented Sarah. I am no artist, yes, I am a crafter, but not an artist. With an ink pad and a stamp, I feel I will pull off a pretty decent image. With tubes of paint and a paintbrush I am totally in an alien area. With the guidance of Sarah this is the canvas I managed to complete on the day. it still needs a few finishing touches, but even at this stage I am so pleased with my first ever mixed media project. needless to say I will be attempting this again. For our theme at Fan-Tastic Tuesday Challenges this week we are asking to see some FIBRES on your SQUARE project. 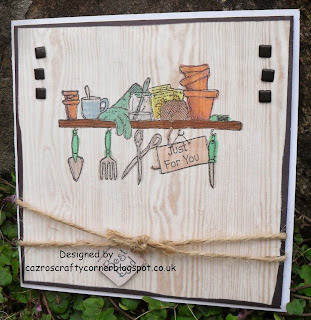 For my background I have used a sheet of wood like paper from a Boho Chic paper pad. I drew an non straight edging to represent a garden shed, added some brads to look like nails, non straight too. Oh! yes, as precise as I like to be, it is difficult to make something look uneven. 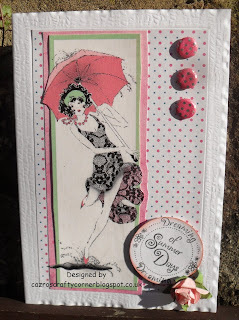 The main image is a stamp by Lyndsay Mason, there are other super shelves available on a sheet. 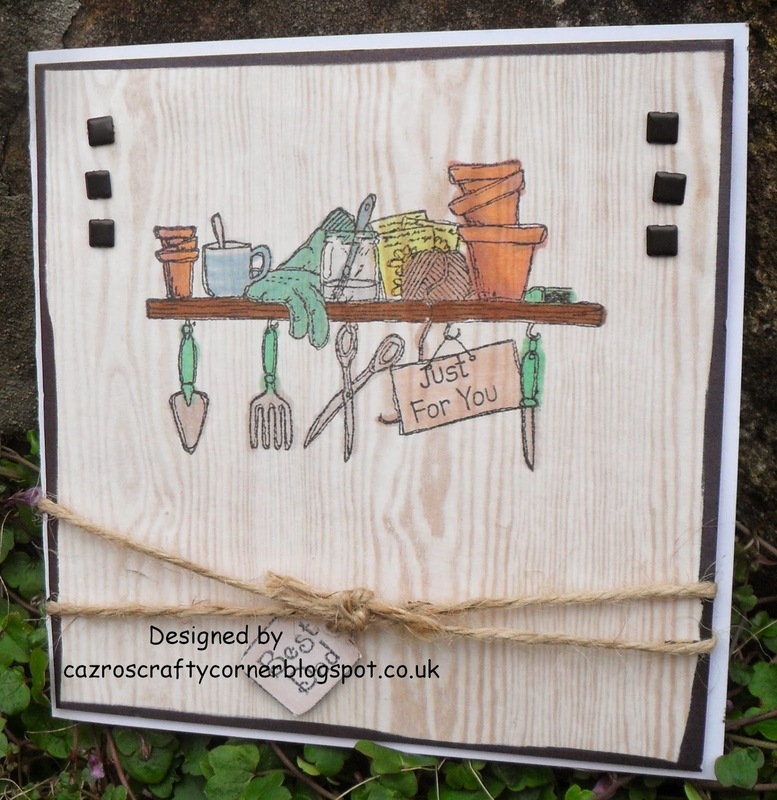 I stamped directly onto the wood background and coloured with Promarkers. I wrapped some garden twine (fibre) around the card with a stamped greeting label for Best Dad. Hope you like it and more importantly that it inspires you in some way. I look forward to visiting you. This week Jocelyn has introduced a different form of challenge, she is looking for a created piece of CD work with Stripes. a few weeks ago, I used the same CD as I have today, Creative Crafting World - Pollyanna Pickering - British Wildlife. I loved the combination of the image along with the striped paper, the colours were perfect.All I have added to enhance the printed sheets, is silver mirri card, on white card. 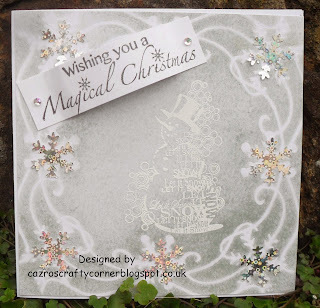 A few silver embellishment stars, Glamour Dust Crystal glitter to the image. 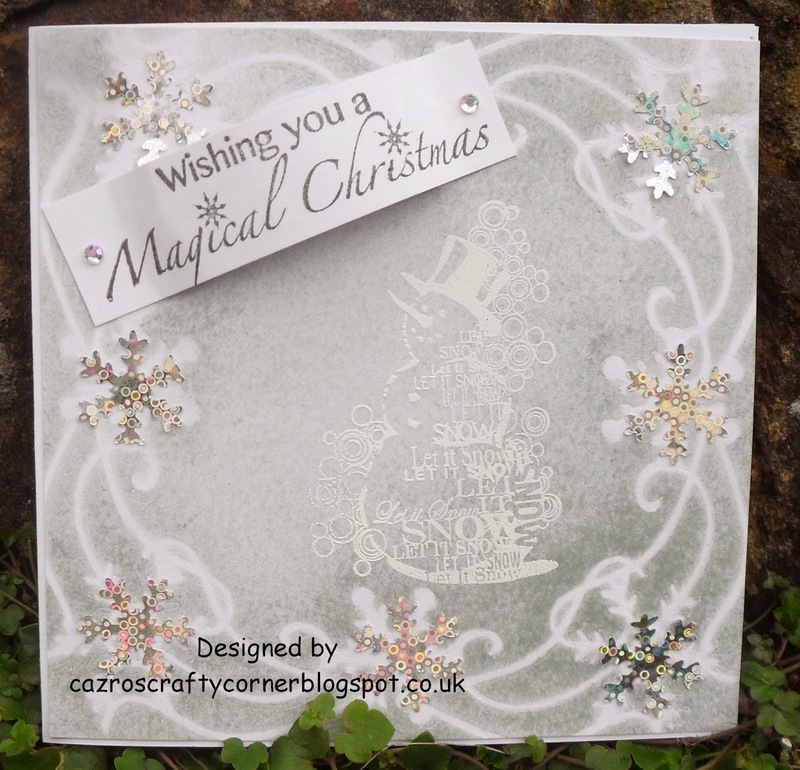 I stamped the Christmas greeting with Versamark and used a detailed white embossing powder, then heat embossed. I'm sure we will have a terrific assortment this week, I am so looking forward to visiting you to see your Stripey works of art from a CD.